OXFORD, Miss. — Coming off an impressive 9-2 win over Saint Louis, Ole Miss emerged victorious in a nail-biter against Tennessee Tech on Sunday by a score of 9-8. The Golden Eagles entered the game with the nation’s best offense, with all nine players in their lineup hitting over .300 and six of those having registered double-digit homers. Brady Feigl was tasked with slowing down the high-scoring offense of Tennessee Tech and appeared to be up for the challenge. He pitched well considering the circumstances, going 4.2 innings and striking out eight, while allowing eight hits and four earned runs. Grae Kessinger led off for the Rebels and doubled on the first pitch he saw. He would go on to score and give Ole Miss its first lead of the day. Shortly after, Will Golsan made it a two-run game with his RBI single. Getting an early lead on this Tennessee Tech team is imperative to having success. No lead is safe against the well-oiled machine that is the Golden Eagle offense. Feigl would soon learn how dangerous they can be. After throwing two hitless innings he gave up back to back dingers in the third which tied the game at two. 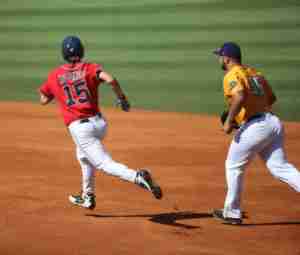 The Ole Miss offense was in rhythm again against Tennessee Tech, collecting nine hits and runs. The Rebs re-gained the lead in the fifth after a Thomas Dillard sac-fly and another Golsan RBI that made it 4-2. However, as we knew they would, the Golden Eagles kept on scoring and tied it once again at four. The teams would trade runs in the sixth to make it a 5-5 game. In the eighth, Kessinger stepped up to the plate for the fourth time, but this at-bat proved to be the most important. 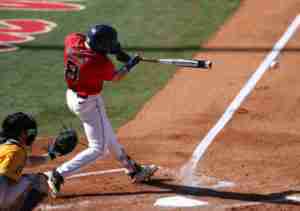 He sliced a ball down the third base line for an RBI double that would give the Rebs a 6-5 lead. The Rebs weren’t done yet. They tacked on another three insurance runs in the ninth for good measure–and would need every single one of them. Will Golsan registered another RBI in what was a spectacular game for him as he ended the day 3-for-5 at the plate with three RBI. Will Ethridge replaced Feigl on the mound in the fifth and gave up three hits and an earned run in 1.1 innings of action. Bianco went to his All-American closer, Parker Caracci, in the seventh to shut down the Golden Eagles high-powered lineup. “Huge inning for Caracci getting out of the seventh after they got a couple of guys on with no outs.” Bianco said. Caracci did just that, not allowing any hits through 2.1. However, he walked three batters which prompted Bianco to switch pitchers again. Greer Holston and Houston Roth both got an out in the ninth, spoiling Tennessee Tech’s comeback attempt and giving Ole Miss a 9-8 victory. Ole Miss improved to 48-15 and tied the program record for wins in a single season. 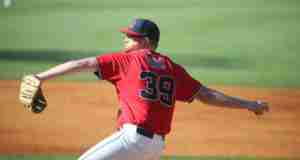 Houston Roth‘s save was the 21st of the season for Ole Miss, tying the team record for the most in a single season. Houston Roth‘s save came as the first of his career. Ole Miss delivered just the 10th loss of the season to Tennessee Tech (49-10). Will Golsan tallied his 20th multi-hit game of the season. His eight three-hit games this season lead the team. Golsan notched his 14th multi-RBI game this season, which ties him with Thomas Dillard for the team lead. Golsan now has 23 two-out RBI this season, the most on the team. Golsan is on a 10-game hitting streak and has reached base in 16 straight games. Grae Kessinger notched his 20th multi-hit game of the season. Kessinger moved into a tie with Ryan Olenek for the team lead with 18 doubles. Ole Miss advances to Monday’s championship game of the Oxford Regional. The Rebels will play at noon CT against the winner of Sunday night’s elimination game between Tennessee Tech and Missouri State.